The Parish Council owns and manages two large allotment sites in the village, and Ashford Borough Council owns and manages a third, small allotment site. Wye is fortunate to have over 60% of all the designated rural allotment land in the whole borough. Most parishes do not have any allotment land. Image: Three allotments marked on the 1841 tithe map of Wye. 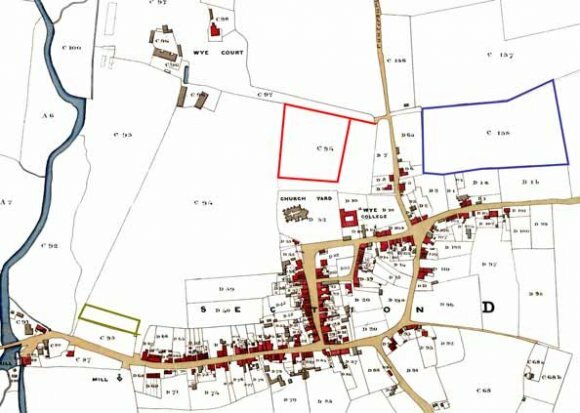 This map shows how the legal protection afforded to allotment land has preserved historic field boundaries. Wye College acquired about one third of Bean Field Allotments in 1962, to build the glasshouses now occupied by Biological Crop Protection BCP Certis. The land is still protected by an agricultural covenant. However, in 1961 Wye College acquired the east part of Churchfield Allotments to build chemistry labs and other educational buildings, but this land had no covenant. Churchfield Allotments are located north of the parish churchyard. Vehicle access is from Olantigh Road. There is limited parking on site. Bean Field Allotments are located adjacent to Occupation Road, with limited parking on site. The North Downs Way National Trail passes beside both allotment sites. Although the allotments are sheltered, both provide views over the North Downs. Ashford Borough Council owns twelve allotment sites in total. Of these the only site outside the built up area of Ashford town is in Wye. Churchfield Way Allotments are accessible from The Twitten, between Bridge Street and Churchfield Way. Access is restricted to key holders only. The A to Z list on this website includes a direct link to Ashford Borough Council's allotment web page.